I love a good disaster flick. Brings back to me memories of movies such as Towering Inferno, The Poseidon Adventure and probably also Titanic. So this based on true events story was an easy prospect. 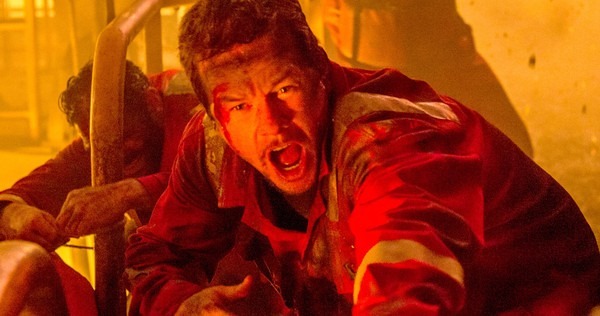 Mark Wahlberg, one of those actors who I’ve always enjoyed in pretty much anything stars alongside veterans Kurt Russell and John Malcovich in the story of a colossal disaster that hit the an oil rig off the gulf of Mexico in 2010. Wahlberg plays Mike Williams, an electrical engineer who returns to work at Deepwater Horizon, leaving his dutiful wife (Kate Hudson) and daughter back home for what he believes will be a routine time on-board an oil rig. However after coming up against the bureaucratic dealings of a group of BP representatives (headed by Malcovich) Mike along with his supervisor Jimmy (Russell) begin to realise several safety measures may have been overlooked. The movie takes a bit of time to get going and I’ll admit some of the technical jargon went over my head. Also Malcovich, usually a reliable presence in any movie, seemed particular subdued and sported a rather dodgy accent. With that said, once things do go south, its full on thrills and spills for the remaining running time. This is pretty intense stuff, directed with authenticity and boasts several heart-in-mouth moments that to be honest made the experience really jump from the screen and unnerve me. Effects work, both practical and I’m guessing CGI were very impressive too. Wahlberg, a very likable actor but with not that much depth, was also a surprise, proving convincing throughout; not too heroic but very human. Russell was a little more stereotyped but despite looking older than his heyday, still had screen presence. Also add to this what appeared to be first time actors or regular people filling out some of the extras for added realism and this had echoes of Tom Hanks vehicle Captain Phillips for an utterly believable representation of a shocking event. This entry was posted in Celebrity, Drama Reviews, Hollywood, Movies, Reviews, Thriller Reviews and tagged Deepwater Horizon, Disaster Movie, John Malcovich, Kate Hudson, Kurt Russell, Mark Wahlberg by Craig M. Bookmark the permalink.